StarTree is an ambitious and exciting project that will show how Multi-Purpose Trees (MPT) and Non Wood Forest Products (NWFP) can be used to strengthen and diversify economic activities in rural areas. StarTree is based on an integrated approach, identifying challenges and proposing solutions to enhance the management, product development, innovation, multi-stakeholder dialogue and marketing of MPT and NWFP. StarTree brings together key research organisations and specialised SMEs working on MPT and NWFP throughout Europe to ensure and speed up the transfer of research and innovations to markets. StarTree relies on strong stakeholder engagement through case studies in 14 regions across Europe and in-depth case studies in 7 key areas. StarTree is funded by the European Union through the European Commission's FP7 Cooperation Work Programme. StarTree aims to provide better understanding, knowledge, guidance and tools to support stakeholders in optimising the management of multi-purpose trees and developing innovative approaches for increasing the marketability and profitability of NWFP for a more competitive rural economy. StarTree engages regional stakeholders to inform the research and development of new tools and knowledge on NWFP and MPT, the results of which will be disseminated widely. To achieve this, the project is composed of seven work packages (WPs). The forest-based sector in Europe delivers a wide variety of products and services, providing income for about 16 million forest owners, and creating around 4 million jobs, many of them in rural areas. Yet traditionally forest industries have focussed on wood-based products: wood has a significant relative economic importance and there are well structured and competitive value chains based on its raw materials (wood products, pulp and paper, bio-energy). This means that the full potential of non-wood forest products (NWFP) remains untapped and opportunities for developing sustainable rural economies have not been fully exploited. Due to lack of information, capacities and knowledge at different stages of the NWFP value chain, realising the full potential of NWFP and multi-purpose trees is often prevented. To ensure a sustainable and optimal provision of relevant forest products and services, forest management requires tools to quantify the joint production of wood and NWFP and the impacts of forest management and environmental conditions in their provision as well as trade-offs between them. 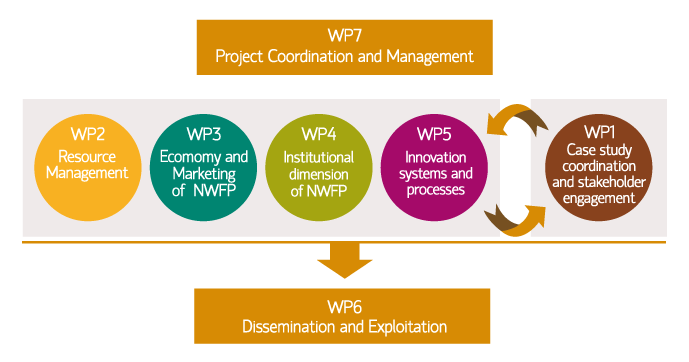 Considerable improvements in all segments along the NWFP value chain are needed. 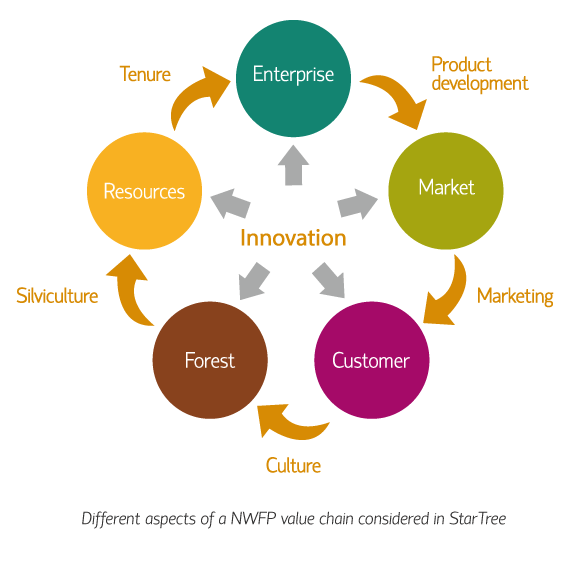 The StarTree project considers the different aspects of the NWFP value chain and provides tools and solutions to fill in the missing links. Non Wood Forest Products (NWFP) are defined as “products of biological origin other than wood derived from forests, other wooded land and trees outside forests”. Forest fruits, mushrooms, pine kernels, acorns, medicinal herbs, essential oils, chestnuts: there are more than 150 non-wood forest products of importance in international trade, according to the Millennium Ecosystem Assessment report. Multi-purpose trees (MPT) means that the same tree is managed and used for more than only one purpose. For example, chestnut trees can be used for production of wood, tannins and chestnut fruits while cork oak trees can produce acorns, can be harvested for cork and finally produce fuel wood. Stakeholders in StarTree are groups or individuals that are expected to be affected by the project’s activities and whose actions can have an impact on the realisation of project objectives. In StarTree they are forest owners, resource managers, SMEs, decision makers, potential users, local and sectoral public authorities, regional development agencies, innovation support structures and rural communities. There are 14 Regional Stakeholder Groups who receive updates and reports on project developments and who participate in meetings and events related to project activities in their region. Small and medium-sized enterprise (SME) is a term recognised throughout the world. What makes up an SME, however, varies from country to country. However, the company’s turnover or balance sheet total must also be taken into account in order to confirm the definition. Growth of trees in their environment, decision tools for controlling forest growth and basic methods for the exploration of tree growth. A consulting enterprise which supports the Association of Austrian Nature Parks by building up the “Nature Park Specialities” label. Food security for all is at the heart of FAO's efforts - to make sure people have regular access to enough high-quality food to lead active, healthy lives. Consultant services and software products for decision-making in forest management, based on own research. Scientific research, technological development and innovation, scientific-technical training, national and international cooperation and the provision of scientific-technical services to government, administrations and private sector. Economic and policy aspects related to the Mediterranean forest sector and Forest protection on all aspects of forest mycology. Natural heritage protection, exploitation of natural resources, chestnut tree activities, fungi forestry activities and the development of community projects. Higher Education, Research & Development and Technology Transfer mainly in the scientific fields of Agriculture, Forestry and Natural Resources, Food Science and Engineering, Animal Production, Environmental Engineering, Biology and Landscape Architecture. Buying Finnish mushrooms and berries from pickers and selling them to companies in Finland. Main centre of forest science in Latvia and one of the leading establishments of scientific ideas in forestry and the related research and development in the country. Developing solutions to the challenges and questions posed by the care, utilisation, products, services and intangible value of forests. Renewable resources and ways to ensure a sustainable, economically feasible and environmentally sound management of natural resources by allying competences in natural, engineering, economics and social sciences. Higher education, research and technical support for decision makers. Forest policy and economics in eastern European countries, silviculture and spatial modelling. Consultancy company providing services in forest research, education, enterprise development and environmental impact assessment.